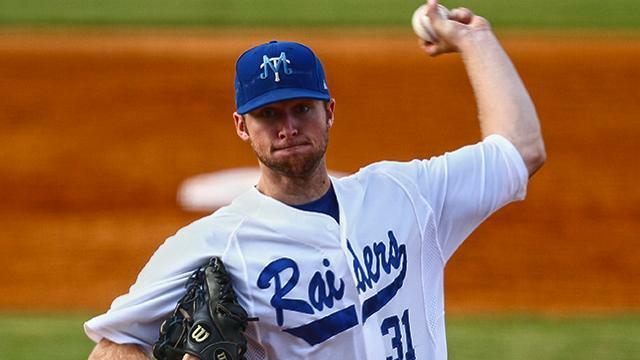 Johnathan Frebis is currently a senior at Middle Tennessee State University where he has pitched for their baseball team for four years. In June, his dreams came true as he was selected in the 33rd round of the MLB draft by the Chicago White Sox. Johnathan was the Sun Belt Freshman of the Year and also a Louisville Slugger Freshman All-American. He had at least 14 games started in each of his four years and senior year he pitched a career-high 83.1 innings pitched with another personal high of a strikeout-to-walk ratio of 2 to 1 (70 Ks to 35 BBs). He has always been deeply involved with baseball and his love began at an early age like most baseball fans. Earlier this month I got to sit down with Johnathan to discuss his budding career, being a professional and having his own Baseball Reference page. CB: How did you feel the first time you played professionally? JF: “It was one of the greatest feelings in the world that one of my dreams had come true. I get to wake up every day and play baseball. Hands down the best job in the world I could ever ask for. Not many people get to say they play a game for a living. What got me into baseball was my dad, uncle, and grandpa. They all had played growing up throughout high school and loved going to Reds games as kids. My first word was “ball” – just kind of always had a ball in my hand of any kind as a child. Just always was playing wiffle ball in the front yard and would always play in the cul-de-sac. My favorite team growing up was the Cincinnati Reds. My dad used to take me to Reds games any time we would be up in Ohio visiting family. They used to always tell me about the history of the Reds and all the greats they watched growing up. My favorite player has always been Ken Griffey Jr. I just loved the way he played the game and the way he always seemed to enjoy playing the game. Besides baseball, I played basketball growing up every year. I finally decided to focus on baseball once I reached high school. How did you grow and develop while at MTSU? Dealing with failure, learning to make adjustments between batters and between innings. You have to learn to pitch situationally as well instead of just trying to strike everyone out. Did you develop any specific pitches? How would you describe your repertoire? I never really added pitches permanently. We were always trying new things in bullpens, like sliders, cutters, and a splitter. Nothing really lasted more than a week or two. I ended up just sticking with what I came in with, which was a fastball, change up, and curveball. Draft day is something all fans dream of, can you describe the process? The process was very stressful. Just got to find ways to keep your mind occupied. My junior year I was following the draft on Twitter and decided I wasn’t going to do that to myself senior year. Fortunately I was working a baseball camp at MTSU. I was talking to my agent throughout the day. Then he was talking to some teams and he told me I was going to look good in black! Then he told me I should be the next pick. Then I found out for sure. Jim McGuire, my head coach was the first person I told. Then my phone was just getting blown up from my friends and family congratulating me. It was a bit overwhelming at the time. I was told I was going to be flying out the next day for Arizona. So I had to make sure I had everything is order, and had to make sure to say my goodbyes to all my friends and family. You were born, raised and went to college in Tennessee. So I’m curious, moving to Arizona, is this the first time you’ve truly been away from home? I had some time away from home playing summer ball in college. Freshman year was in Toledo, Ohio. Then sophomore and junior year were spent in Harwich, Massachusetts in the Cape Cod League. I did not know anyone out in Arizona. My host family from the Connie Mack World Series in high school lived out in New Mexico. That was about the closest I knew of anyone around. [The minor leagues] are just like I imagined – just living life and playing baseball. You end up making some great friends on those road trips and know that they are going through everything you’re going through as well. How cool is it to have your own baseball-reference.com page? It’s pretty cool. I usually use [baseball-ref] to follow guys I’ve played with in summer ball, high school, or college together. You have always been a starting pitcher but now you’re beginning to close games in A-ball, can you describe the difference and how difficult a change moving to the bullpen is? My main focus in being a relief pitcher is to be able to come in and handle any situation at hand. I got the opportunity to close games some in rookie ball, because that just happened to work how the rotation of our bullpen worked. I would usually follow one of two guys every time I went out and pitched. Just so happened that some of those times it was to come in and close a game. I do try to take a closer’s mentality with me any time I come into a game so it was pretty natural. Just do your best not to let anyone on base or score. Sounds simple but that’s always the ultimate goal. So is there truly is a difference when you’re entering in a save situation? I think it plays in a decent amount. Especially if that’s what guys are used to. There’s just a certain adrenaline rush when you come into the game and you know it’s on your shoulders. Because a lot of times, in my opinion, you can’t create that adrenaline out of thin air. That’s just what makes it special when someone comes in the bottom of the ninth and just shuts the door. With that being said, to me it just comes down to having confidence that you are better than that hitter in that situation. You have to believe are the baddest man on the planet to an extent, which is what my dad always taught me. Cause even the good hitters are only going to get a hit 3 out of 10 times. So you just have to throw your best stuff out there and have faith it’s better than the hitters. There’s been a spate of “co-closers” in the big leagues. The Nationals did it last year, and it appears the Dodgers (in their attempts to acquire Aroldis Chapman) are looking to do so this year. How does that affect a closer and the alpha-dog mindset? I can see where it would be a problem, because one guy would have to take a backseat to let the other guy do his job. That’s where you just want a guy who can go out there and accept his role and give you his best effort no matter if he is the closer or not. How much scouting goes on at the High-A level? There’s not too much [scouting] at our level. Obviously we know the hitters that we can’t let beat us. But there’s not a whole lot. I’m sure there’s more the further up you go, because there’s more on guys to be found. In college there was a little more going on. We knew what guys had done previous years and even their tendencies before we even played them. But where I’m at right now it’s just trying to prove who the better ball player is. So there aren’t many advanced statistics for you to look over day-to-day? To my knowledge not much from a pitching standpoint in my experience. I don’t know from the hitters’ standpoint. I follow along with that well. Our college coaches were big on it. Especially [fielding] shifts later in the year when they had a better idea how hitters made adjustments. As a pitcher I know what counts I need to try to stay out of. And when guys are looking for certain pitches or trying to hit it a certain direction. Just have to know the situation when the guy steps into the box. Finally, is there someone you look up too, model yourself after and are trying to emulate? I used to always enjoy watching Randy Johnson pitch back in the day. I like the demeanor he brought to the mound. He never looked like he was ever scared of another hitter. He just had that look like he was going to beat you. You knew he was coming at you with his best stuff. He knew he was going to win.